Hope y'all are having an memorable Memorial Day enjoying time off with family and friends. And you SHOULD enjoy it, the cost to preserve the freedoms we have in this country are enormous. But, having already posted on specific individuals I remember on this holiday, I think I'm going to discuss a topic I regularly post on. Medal of Honor recipients. Given the usual high cost of receiving the Medal of Honor, I'll choose to use the word "Fortunately". Fortunately, I'm quickly running out of Air Force recipients of our Nation's highest military award to post about. As I posted last week, I had some training I attended last weekend in Dallas. It's about a 5 hour trip up and back and as I wasn't driving, I had time to do a little reading. One of the several books I have open in Kindle (I switch between them often as I ascertain what my attention span will sustain at any given moment) is "Check Six! A Thunderbolt Pilot's War across the Pacific". It's an interesting book, combining verbiage from the author and supporting data from Squadron Histories. The primary AOR for Lt Curran's war is the Fifth AF in the South Pacific. I'll confess that aside from Bong and Kearby and the Yamamoto shootdown, I really don't have an in depth grasp of that AOR's history. Which is interesting as both the 80TFS (aka "The Juvats") and the 339TFS were assigned to 5th AF in WWII and later were squadrons to which I was assigned. History is wasted on the young, I guess. So, the car is speeding along towards Dallas delivering me to a rendevous with my "How to tune databases" destiny ("Woo Hoo! "), and I'm reading away when I come to this passage. I thought that PBY pilot and crew were pretty ballsy, landing 4 times in hostile waters well within gun range of alerted AAA crews and eventually rescuing 15 Air Force crewmen and returning them to friendly hands. My brain immediately went into posting mode. How would I search to find out who this crew was? Fortunately, the author's person in charge of researching stories had footnoted the incident and provided the pilot's name. So, let me introduce you to Lt (j.g.) Nathan Gordon. 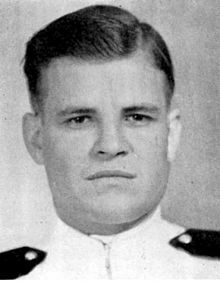 Lt Gordon had graduated from University of Arkansas with a law degree in 1939, practiced law for a couple of year before joining the Navy in May of 1941. Getting his wings and getting checked out in the PBY, he was assigned to the south Pacific AOR. On Feb 15, 1944, 5th Air Force attacked the port of Kavieng with 4 squadrons of A-20 Havocs and 7 squadrons of B-25s. Slightly less than a 700 mile round trip. A long way even in modern day fighters. Heavy, and accurate, AAA (HISS!) shot down 8 of the attacking planes, with 5 of them ditching inside the lagoon. Lt Gordon and his crew aboard his PBY (Bureau Number 08139 "Arkansas Traveler") are vectored in to try and retrieve the crew of one of the A-20s. Landing in 16-18' seas (! ), they are unable to locate survivors, seeing only a couple of life jackets and debris. Taking off again, they realize their aircraft has taken on water due to the heavy seas. 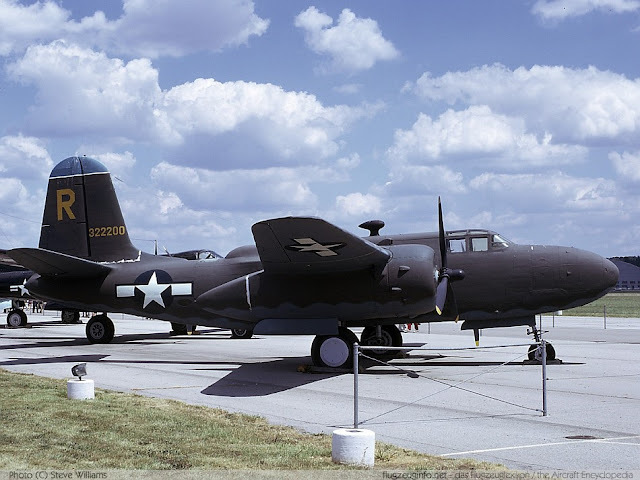 About this time, they are vectored to a ditched B-25 piloted by Major Coltharp, CO of the 496th Bomb Squadron (yep, real people). Lt Gordon makes his approach and stalls the aircraft into the water (intentionally to minimize landing run). Taxis up to the Major and his crew of 6 and realizes the waves will carry the life rafts uncomfortably close to the port prop. He asks the crew chief if they shut it down will he be able to restart it. With an affirmative, Lt Gordon shuts down the engine and retrieves the crew. They restart the engine, takeoff and start to head home. 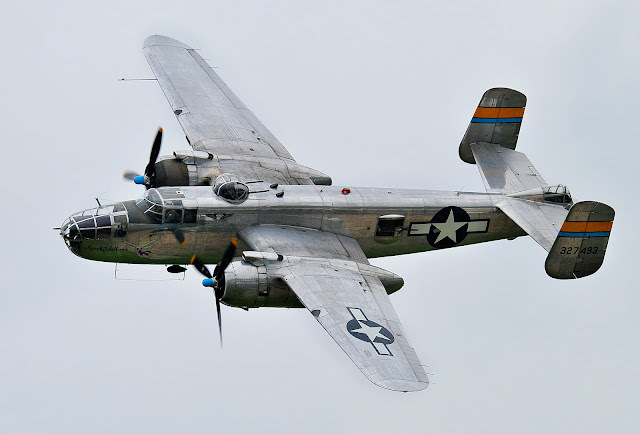 However, they are alerted to another downed crew from a B-25 about a mile from shore. Spotting the debris and three survivors, they land again, shut down the engine and retrieve them. Meanwhile, overhead, the P-47s have had to RTB due to low fuel. As Lt Gordon takes off and starts to RTB, the B-25 that had been spotting ditched aircraft calls them again and directs them towards another crew, very close to shore. Assured by the B-25 that he would remain and provide cover against any Japanese float plane attacks, Lt Gordon makes another landing about 600 yards from shore. Using the heavy seas as some protection from AAA and small arms fire, they manage to rescue 5 members of Captain William Cavoli's B-25 crew. As they complete the process of pulling Capt Cavioli's crew aboard, the co-pilot starts the starboard engine and attempts to start the port engine. It will not start. Realizing that the engine is flooded, Lt Gordon directs the co-pilot to stop trying to start it. For an agonizing couple of minutes, the PBY taxied in a circle with Japanese shells coming closer every second. Finally, Lt Gordon engages the starter and the engine comes to life. With 15 extra bodies on board, the overloaded PBY staggers into the air and maintains a stately 90 knot pace back to Finschafen, arriving there after a 7.4 hour return flight. Depositing the rescued airmen their, he flies another 2.6 hours back to his base. For an interesting version of this mission from the POV of the B-25 crews read here. 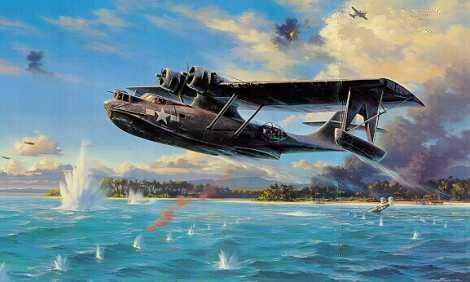 According to Lt Curran's retelling of the story, the PBY sank as it coasted up to the beach at it's home base. Lt Gordon's version does not mention that. If it's true, it certainly adds a level of interest to the story. Airplanes have souls, you know. This one held on to the very end. For extraordinary heroism above and beyond the call of duty as commander of a Catalina patrol plane in rescuing personnel of the U.S. Army 5th Air Force shot down in combat over Kavieng Harbor in the Bismarck Sea, 15 February 1944. On air alert in the vicinity of Vitu Islands, Lt. (then Lt. j.g.) Gordon unhesitatingly responded to a report of the crash and flew boldly into the harbor, defying close-range fire from enemy shore guns to make 3 separate landings in full view of the Japanese and pick up 9 men, several of them injured. With his cumbersome flying boat dangerously overloaded, he made a brilliant takeoff despite heavy swells and almost total absence of wind and set a course for base, only to receive the report of another group stranded in a rubber life raft 600 yards from the enemy shore. Promptly turning back, he again risked his life to set his plane down under direct fire of the heaviest defenses of Kavieng and take aboard 6 more survivors, coolly making his fourth dexterous takeoff with 15 rescued officers and men. By his exceptional daring, personal valor, and incomparable airmanship under most perilous conditions, Lt. Gordon prevented certain death or capture of our airmen by the Japanese. After this episode, Lt Gordon is returned Stateside where he performs instructor duty for the duration. Returning to Arkansas after the War, he restarts his law firm and runs for office as Lt Governor in 1946. He remains in office until 1966. He passed away in 2008. * Curran, Jim. Check Six! : A Thunderbolt Pilot's War Across the Pacific (Kindle Locations 1714-1716). Casemate. Kindle Edition. Talk about courage, performing rescue after rescue while under fire and then flying that plane for so long to RTB.......aye Juvat, Rest in Peace Lt Gordon. Agreed. I thought the brief summary in Lt Curran's book was eye opening. The details even more so. I spent some time following the links, which leads to more links to follow and so on. It was time well spent. Lt. Gordon has my respect. Almost time to put up the flag out front. Gonna do a bit of link following myself today. The stories of these men never cease to inspire. Bravo Zulu Lt Gordon and crew! The amazing thing was at any time after the first rescue, they could've called it a day. Successful rescue, damage and taking on water, full house, rough seas and no one would have thought the worse. Yet they persisted (no, they ACTUALLY persisted), until they'd rescued everyone they possibly could. That truly is "No greater love...."
What an amazing performance by all involved. Yep, superb airmanship, unbelievable courage with a large sprinkling of luck resulted in 15 folks we don't have to remember today for that mission. I look up his squadron- VPB-34 was very accomplished. Nicknamed the Black Cats, he truly had 9 lives, and he used up 4 or 5 of them that day. Those flying boat operators, basically independent commands, and the submarines and destroyers, saved so many lives. The Pacific at it's calmest is an empty desert waiting to kill one. Let alone when the wind and waves are busy. Storm tossed, the Atlantic may be, but alone is the one who is lost in the vast Pacific, dotted only by little islands and atolls that held death of one form or another. For all its horribleness, the European and African war fronts were much more civilized than the Pacific. One could actually survive, injured in that area. Not so much the Pacific. As to the rescued crew, how horrible it must have been for them. Too often the plane's parents (the pilot and copilot) died holding the plane steady so the rest of the crew could attempt to bail. To lose your plane, your crew and one or more of your 'parents' at the same time, and to be lost somewhere in another world than the farm or city you came from. Survivor's guilt. Besides remembering all who fell on this day, also remember all who died inside, who suffered afterwards and often ended their own suffering. Death isn't always an instant thing. I count those fallen heroes to the tally of the deaths in the field. In a different portion of Lt Curran's book, he described a P-47 Pilot who lost an engine on takeoff, bailed out and spent the next 6 weeks trying to bet back to the base, a distance of less than two miles. By the time he returned he was essentially naked and carrying only his survival knife. Diseased and malnourished, but mostly mentally kaput, he was sent back to the states, his war was over. Got a little taste of that as a Lt. Deployed to Cope Thunder and got "selected" for some survival training. We were only 10-20 miles from Clark. It was as if civilization was non existent. So, you're right on target as usual, Beans. One of the fun 'recreation' things at Kwaj was to win a spot on a fishing boat that went out in the deep. The boat could be 3 miles from the island and it was just as lonesome as 30 or 300 miles away. Nothing out there but birds, fish, waves and whoever else is on your boat. Contrary, after dad retired, we regularly went 20 miles or more out of Sebastian Inlet, FL, in a much smaller boat. But there was never the sense of aloneness as the Pacific engendered. Flying from Moody to Taegu Korea in the F-4, there was a lot of nothing for a long time. Finally caught site of Wake and thought that was a big deal at least there was a runway to land on if needed. Then a few years later, I deployed there for about 6 weeks. Pretty island, nothing to do there. Morale and Recreation troops and civilian staff have their hands full on 'outpost' style bases. For whatever reason, the link under "there" in ....deployed there wasn't very obvious. There wasn't a lot of MWR activities going on while I was on Wake. What? They didn't have any beer or other alcohol? From what I saw at Kwaj, that was the way lots of adults went, rather quickly. Lack of eligible females kept the whoring down from what I heard. So, fishing, swimming, bicycling, golf, bowling and booze. And some other more esoteric hobbies. No TV. One radio station. Okay. The place was boring. Would have hated being based there as a single young man. Especially with all the baggage restrictions. Unfortunately, since it was a "real world" mission, booze was restricted. I think there was a bowling alley of sorts, but I don't remember a golf course. Running was a big activity and since there was always an off shore breeze, it wasn't too bad. What little time off I spent walking around the island looking at places from back when "the issue is in doubt". Thank you for making known to me this fine American. Cool article. I'm not sure that I'd read it before, but I was familiar with President Bush's tour on board. I didn't remember the story of the second guy clinging for dear life to the periscope mast. In other circumstances, that might have been humorous. I don't think he thought it was at the time. However, it had a happy ending. Not sure as an aviator that I'd have been especially thrilled to list depth charge attack as one of the things I'd survived. But then again, not surviving a depth charge attack would have been much worse. Yeah, the PBY crews did whatever they needed to, wherever they needed to, to get the job done. He was in VPB-34 at the time. They had relieved VP-11 out of Port Moresby. He also made THREE full stall open water landings, which are dangerous as hell, but stop the aircraft quickly. The PBY-5s they were flying were the first with self-sealing fuel tanks, which definitely helped in this case! So...you've heard this story then? Any tidbits to add? OK, I'm not sure when your published the new masthead, Sarge, but I like it. Yes, you snuck that change right by me, too. I don't think the change had been made at the time of my first comment, but I'm not sure if I looked closely at the masthead this morning. Also agree with juvat. I do miss LUSH's helmet though I don't see how you could have kept it without totally reworking the whole masthead. LUSH's helmet is still there, way down on the sidebar. But still there. I think I would have liked him. I'd certainly liked to have had a beer or two with him. As LL said on CW's page, that PBY crew clanked when they walked. Why is this not a movie? I read the links, I had never heard of this event. Award descriptions never tell the whole story. I don't think it'll be made in this day and age. However, BITD, I could see the Duke in the title role. Although I think Robert Mitchum would have been a better fit. Maybe someone should approach Paul Allen. Yeah. Apparently there are at least 5 wrecks in the harbor, plus assorted Japanese wreckage. I am currently reading 20 Million Tons Under The Sea, by Daniel V Galley, about the capture of U-505. In 1942-43, he was the CO of NAS Rejkavik. He writes that the daily patrols of his PBYs were at least 14 hours long. 5 hours to the patrol area, 4 on station, and 5 back, if everything went smoothly. All Hail the PBY Crews, Praise Them With Great Praise! If you can find them, read Gallery's fiction books. "Now Hear This" and "Stand By to Start Engines", I believe, are two of the titles. I found them to be very good reading. Always looking for more good books to read. The problem is I'm already several (dozen) behind. But...I will see what I can see. The man could write, there is no doubt about it! I have a copy of Cap'n Fatso around somewhere. I loved his Palm Trees in Iceland and his post title for the brits, DDLM. My kind of skipper. Dan, Dan, the Lavatory Man! He founded Admiral Dan's Pandemaniacs, the Tenth Naval District Steel Drum Band. He was a versatile fellow! For Juvat, I watched an LPD try to anchor 4 times off Catalina Island. My house was on the bluff looking out over the non-existant bay where they kept dropping anchor and it kept going down a thousand feet. They'd run out of chain. They kept coming closer and closer, inch by inch, step by step, and trying again until my radar showed that they were just 900 feet away. At that point the skipper gave up and went back to sea. Being a sailor of nothing larger than a 19' sailboat (restricted to within Hickam Harbor), I know virtually nothing about anchoring a ship. How did anybody anchor there? Or DID anybody anchor there? That must have made an impressive noise when it came to the bitter end! A mighty BOOM!, from the hawsepipes! You'd need more than 11 shots of chain. a shot is 15 fathoms. So...more than 990' of chain, but was it that deep all the way in, and he didn't want to come closer, or did he just not have enough chain, and other large ships did? If possible, you should have your own length of chain on the bottom, as it acts as a drag, and keeps you drom dragging. For example, the Big Badger Boat , being an IOWA class BB, is 887 feet long, so she would need a minimun of 1900 feet of chain to anchor in 1000 feet of water. I doubt that she carries that much.